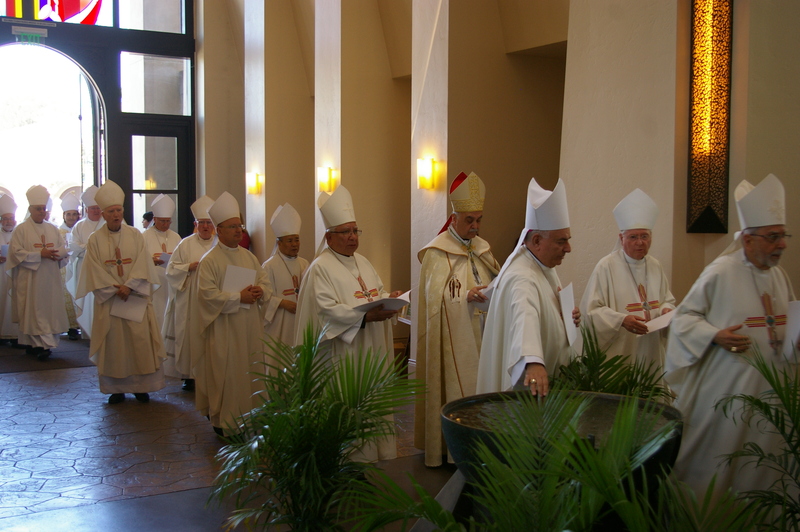 Last week I made a quick trip to San Diego for the installation Mass of their new bishop, Most Rev. Robert McElroy, formerly auxiliary bishop of San Francisco. I was able to see some of my former students who are now priests of the diocese of San Diego. Here I am with Bishop McElroy. 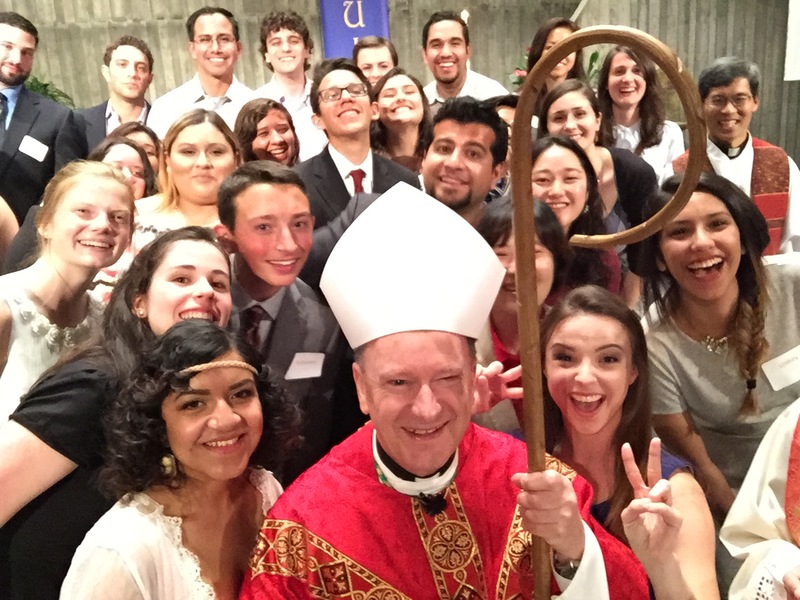 On Thursday the 16th I was invited to celebrate Confirmation at Holy Spirit Newman Center in Berkeley. Great group of young people who responded enthusiastically during the service. 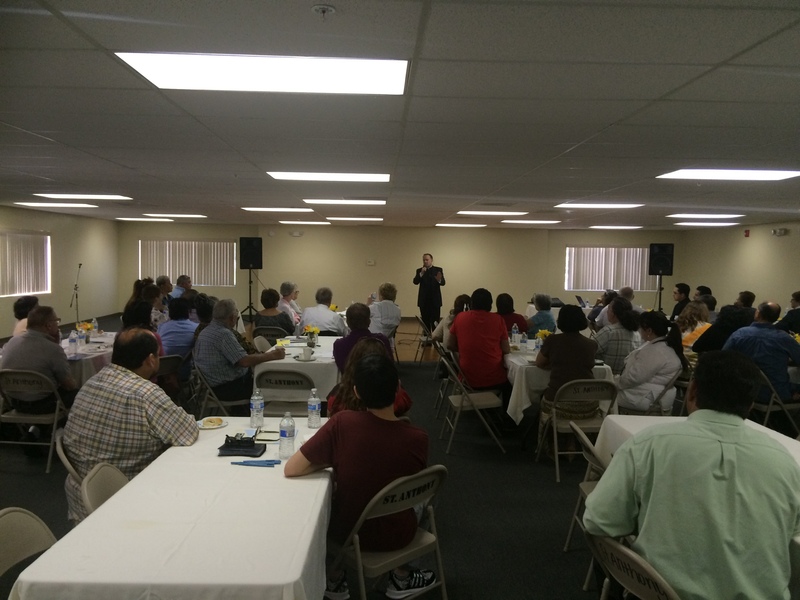 There was an atmosphere of joy, respect, reverence, and communion-with-the-Church. Friday, I visited two parishes at opposite ends of the Diocese. 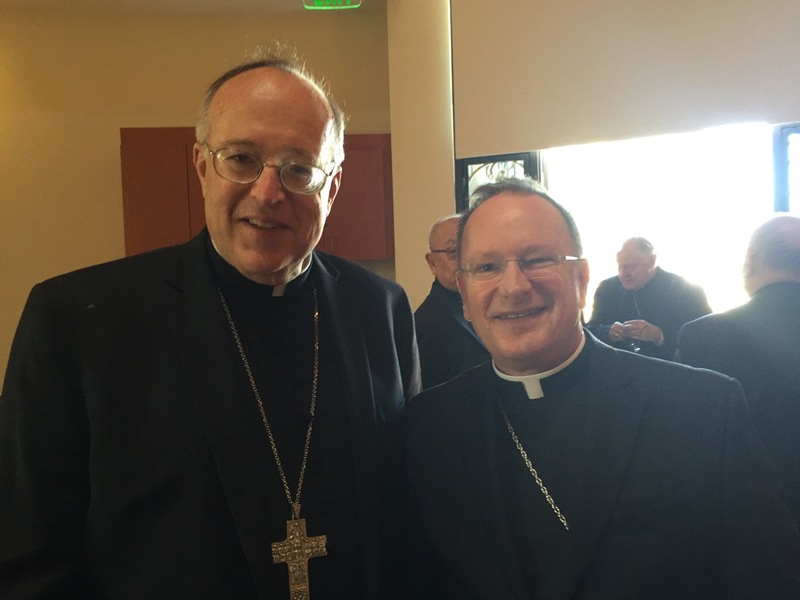 I celebrated morning Mass at St. Michael’s Livermore, followed by a Capital Campaign reception. Afterward, the pastor, Fr. Van Dinh, showed me the ceiling of the parish hall, which is collapsing inward. St. Michael’s is going to use their return on the Campaign to make necessary repairs to the historic hall. I then went from Livermore to St. Anthony’s in Oakley. Arriving at the parish hall for a lunch Campaign reception, I found the pastor, Fr. Ken Sales, in the kitchen, personally making a “Maja Blanca” dessert. Fr. Ken takes our Lord’s words “Feed my lambs” seriously. He even made an extra dessert for the bishop to take home. 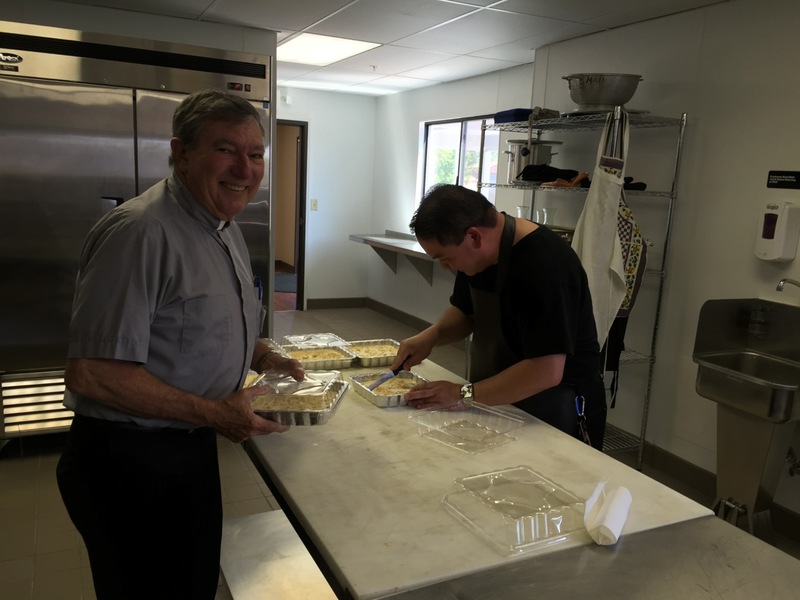 Here he is with Deacon Alan Layden, putting last minute touches on the cake. Giving me a tour of the grounds before our reception, Fr. Ken showed me where the parish would like to build an Adoration Chapel with the proceeds of the Campaign. I am sure God will bless this undertaking. That evening I celebrated a Vigil Mass at Santa Maria parish in Orinda, followed by a Campaign Reception in the parish hall. They have a special choir at Santa Maria, composed not only of adults, but of children and teenagers. One outstanding young fellow came to church literally right off the baseball diamond. Jack sings in the choir with his sister and mom. On Sunday morning I was back in Livermore, this time to visit the newer parish, St. Charles Borromeo. 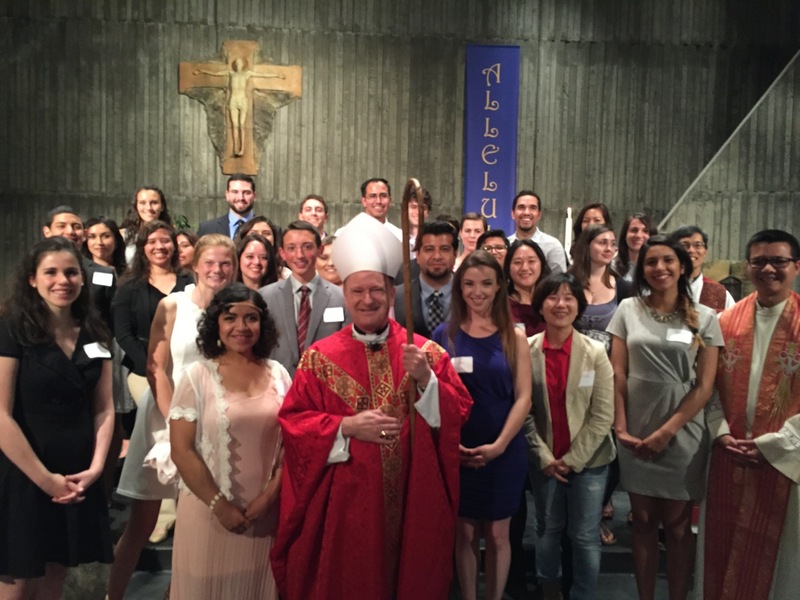 I celebrated the 11:30 Mass and administered Confirmation. Fr. Mark Wiesner, the pastor, is very tech-savvy. He live-streams Mass on the internet every Sunday. During his remarks at Mass, he mentioned how St. Charles’ Easter Vigil Mass had the second most hits on YouTube for an Easter Vigil after the Holy Father’s Mass in the Vatican. I would have gotten a haircut if I’d known he was going to broadcast my Confirmation all over the world. I almost drove right by the parish. The outside of St. Charles church looks like a Chinese restaurant. The inside looks like a gym (the original purpose for the building). Yet the liturgy was very beautiful. There was enthusiastic participation at the Mass, especially from the Confirmation candidates.
. 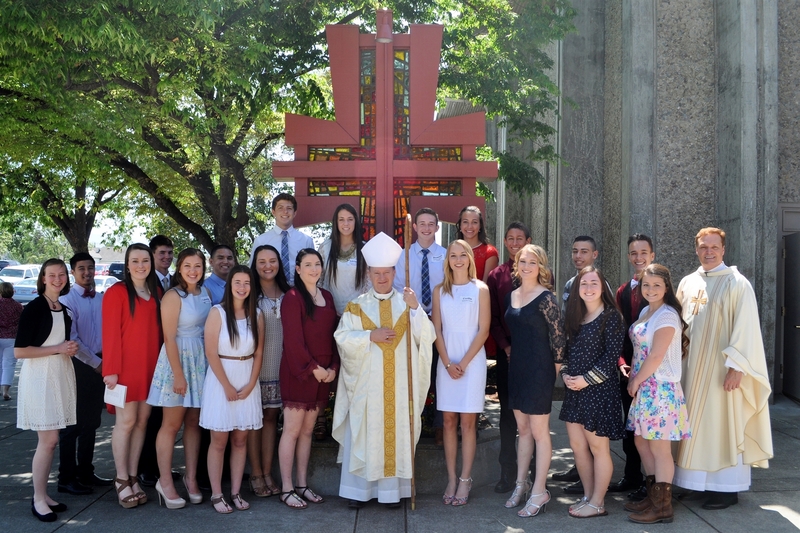 Here are the young people that were confirmed.